As mentioned in a previous post (click here), I’ve been using SkySafari as my primary planetarium program, linked via WiFi to my netbook running EQMOD. This works brilliantly. However, it’s one thing doing this on a home network, where you have a wired/wireless router to connect both the Tablet/Phone and the PC to, and a totally different kettle of fish if you want to take the setup out into the ‘wild’ so to speak. For example, if you go to a star party, or a dark sky site, you can’t exactly uproot your entire home network and take it with you. For the rest of this article, I’ll be using iOS, i.e. The iPad/iPhone, as the example of the SkySafari device, as that’s what I use myself. Android is a bit different as it apparently has a little more trouble connecting to the type of network I’ll be describing, but I can’t help at the moment as I don’t have an android device to try it out on. Please feel free to comment, or contact me with additions to this article if you can provide a bit more info on that. This will also only be talking about Windows 7 for now, as this is currently the most popular OS out there, and extremely stable for astro use. This is also possible on Windows XP, Vista (bleurgh! ), and Windows 8. As this can be a bit confusing, I thought I’d give a little info on how to set up what’s known as an ad-hoc wireless network. This enables the iPad and the PC to talk over a wireless connection without the aid of a router in the middle. It requires a little more manual setup than a standard WiFi connection, but will live alongside your existing wireless settings on both the PC and table/phone without stopping you using them. 1. Right click the wireless icon in the system tray (usually if you’re connected to a network already, else a small computer) and select ‘Open Network and Sharing Centre’. 2. Click ‘Manage wireless networks’. The following dialogue box will appear (yours will have different networks in it, or possibly none at all). 6. 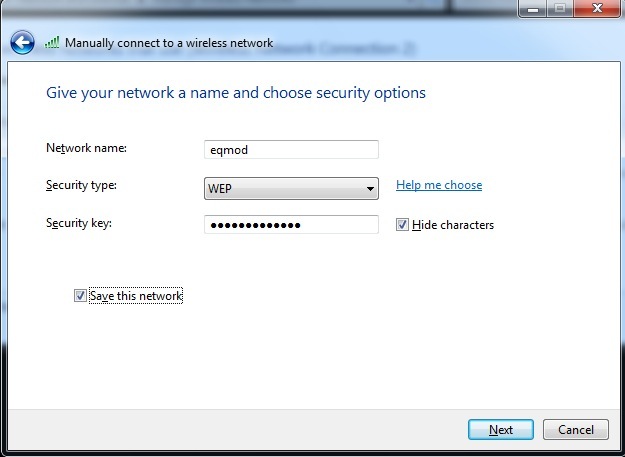 Give the network a name – ‘eqmod’ in this case and select security type ‘WEP’. Before anyone technical jumps on me – yes – I know WEP is an out-of-date security method. It’s a very easy standard of encryption to hack, and should not be used for day to day home wireless. However, Apple devices don’t currently support anything other than WEP on ad hoc networks. Yes I know its a bit rubbish, but thats how it is. In the end, it shouldn’t matter too much. This is only for a connection between your iPad and PC when you’re away from your normal wireless network, or don’t have a normal wireless network available. Also, the ad hoc network has to be activated each time before you can connect the iPad to it. Thirdly, the PC itself will generally be a separate one from the one you use to store all your personal data, so it’s hardly that worrying anyway. Lastly, each device needs to be set up with a static IP to make this work. Basically – I would’t have thought you’d have much to worry about…! Your home network connection will carry on as normal, using whatever security is set up on it – this does’t affect that. 8. Check ‘save this network’ and click ‘next’. 9. This sets up the ad hoc network, and activates it. You’ll get a message to say that its ready to use, with a reminder of your network name an WEP key. However, you can now close the window (with the ‘close’ button), as you need to do some more setup before you can finally use the connection. 10. Right-click the wireless icon in the system tray and select ‘Network and Sharing Centre’ again. 11. This time, click ‘Change adapter settings’. 12. Right-click your wireless connection (usually called ‘Wireless Network Connection’ or similar), and select ‘Properties’. 13. Double-click ‘Internet Protocol Version 4 (TCP/IPv4). 14. Click the ‘Alternative Configuration’ tab. 15. 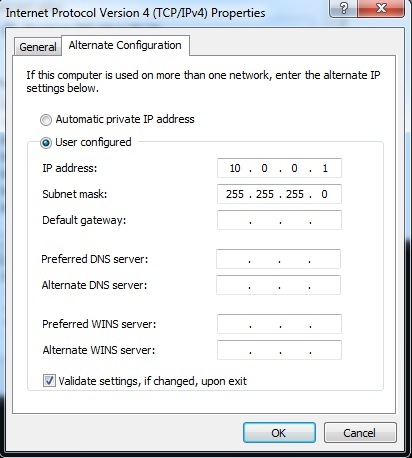 Select ‘User Configured’ and enter 10.0.0.1 in the ‘IP Address’ field, and 255.255.255.0 in the ‘Subnet Mask’ field (as below). 16. Uncheck the ‘Validate Settings’ box if ticked, and click ‘OK’, then click ‘OK’ again. Your Windows 7 PC ad hoc connection is now ready. 17. To make sure that the ad hoc network is broadcasting and ready be connected to, click the wireless icon in the system tray, and you should see that the new ad hoc network is ‘Waiting for Users’ (see below). If not, just select it and click ‘connect’. Once it’s Waiting for Users, you can set up the iPad/iPhone. The setup on the iPad/iPhone are the same as each other. It’s basically a case of connecting to the network, then setting a static IP address for that network. This is done as follows (for devices running IOS7 – should be similar in previous versions too). 2. 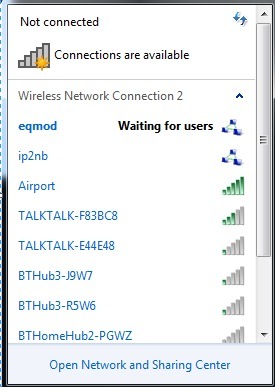 Under a section called ‘Devices’ you should see your ‘eqmod’ network showing up. tap this. It will tell you that ‘eqmod’ is not connected to the Internet, but you should click ‘Join Anyway’. 3. 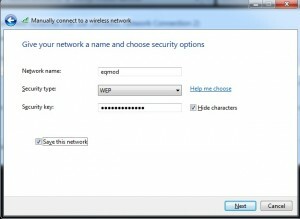 Enter the 13-character WEP password you set up earlier on the Windows PC and tap ‘Join’. Your device should join the ad hoc network. This may take up to about 30 seconds. The first time you do this, your Windows PC will now pop up a window for you to confirm the network. Just confirm it as a home network. 4. Tap the ‘i’ to the right of the name of the network. 5. Tap ‘Static’, and enter 10.0.0.2 in the IP address, with 255.255.255.0 in the subnet mask. 6. Finally, switch on ‘Auto-Join’, so that your device reconnects automatically if it goes to sleep. 7. Tap ‘WiFi’ in the corner to go back, and then ‘settings’ to come out of the WiFi page. You’re done with the network setup side of things. You are now in a position where you have an ad-hoc network set up, with your PC having the address 10.0.0.1, and your iPad/iPhone the address 10.0.0.2. They can now communicate with each other over this network. To reconnect to your home network, simply go back into your WiFi settings and reselect your home network if required. 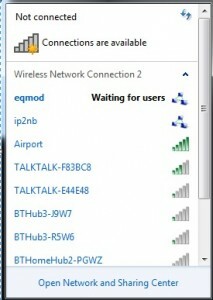 b) Go to the WiFi settings on the iPad/iPhone and click the ‘eqmod’ network. c) Give it all 30 seconds to establish. You should now be able to run EQMOD and WiFiScope on the laptop as described in the previous post (click here), using 10.0.0.1 as the address to connect to in SkySafari. 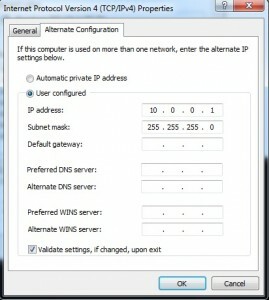 – Reserve your PC’s IP address on your home network so it never changes. You can usually do this in your router configuration somewhere. – Set the ‘Alternative Configuration’ on the adapter to the same address and subnet mask (don’t worry about the default gateway). – Set your iPad/iPhone into the same subnet. If you do this, then you don’t need to change the address in the SkySafari settings when moving between your home networks and the ad hoc network. I’m trying to create an ad-hoc network between my windows 7, my mac and my iphone, due to the fact that i live in an apartment and the landlord refuses to let me install a wireless router. So i am stuck with a wired modem. I have created a ad-hoc network on my win 7, and that claims to be connected. On both my MBP and my iphone, they find the network under devices. I have connected both, however neither of them actually connect to the internet. If you could help it would be much appreciated. I cannot talk to a local computer store as i don not speak the local language. That’s a bit of a different situation to what I’m describing here. This is not for internet connection sharing, but rather for setting up a network for two devices within the network to talk to each other. To do what you’re describing, you need to set up internet connection sharing on the windows 7 machine, as well as the ad-hoc network. I think this is what you need, but using the MBP or iPhone instead of the second windows machine. Also, it’s kind of bizarre that your landlord won’t let you set up a wireless router….! Setting up an ad-hoc network is basically exactly the same from his point of view. If I were you Id buy a wireless router and then just hide the SSID (network ID). That way, he’d likely never know, but you could still connect to it as you’d know the network name even though it’s not broadcast. There are three usable channels on 802.11n 2.4Ghz network (1, 6 and 11 – all other overlap with these, so should’t be used), so unless he was using all three (i.e. more than two wireless routers or access points in the house), then you won’t even cause any interference. These days, there are wireless networks everywhere – can’t understand why he’d object… To be honest, I wouldn’t even have asked, it’s kind of a given these days…!